But the appeal to his Fine Gael colleague, Paschal Donohoe, doesn’t appear to have paid off. A FINE GAEL junior minister privately appealed to his party colleague, the finance minister, to spare hospitality businesses some of the short-term hit from higher VAT charges. During Budget 2019, it was announced that the special 9% VAT rate for hospitality businesses would return to 13.5%. The lower rate was introduced as a temporary measure to help the tourism sector during the recession. 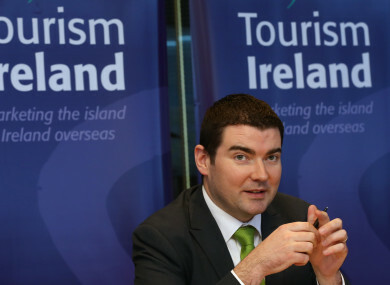 However in the aftermath of the budget, Minister of State for Tourism Brendan Griffin appealed to Finance Minister Paschal Donohoe to allow tourism firms to pay the old 9% VAT rate on business contracted before the new rate came into effect on 1 January. In a letter, released to Fora under freedom of information laws, Griffin wrote that during meetings with tourism lobbyists, concerns were raised about how business already contracted by the hospitality sector prior to Budget 2019 would be affected. He asked Donohoe to consider his request that “favourable consideration” would be given to allowing the old 9% VAT rate to apply to pre-booked business. “As the minister with special responsibility for domestic tourism, I would support this request. I am particularly concerned that the existence of some smaller businesses, along with employment created by those businesses, could be threatened,” Griffin wrote. He added that in 1993 – when VAT went from 10% to 12.5% for hotels and guest houses – the then finance minister allowed contracted business to be subject to the lower rate. Despite the junior minister’s appeal, a Department of Finance spokesman told Fora that the Revenue Commissioners would follow the “fixed guidelines” on how VAT changes were applied. “The applicable VAT rate is based on when the payment is made as opposed to when the tourist or other service takes place,” he said. In separate correspondence to the Department of Finance, the Irish Tour Operators Association (ITOA) said all of its members have “completed contracting for 2019 business as early as late 2017 and in the first quarter of 2018″. The Irish Hotels Federation also voiced concern to Donohoe about how the new VAT charge would negatively affect the margins its members expected to make from pre-booked weddings. Speaking to Fora, ITOA chief executive Ruth Andrews said Irish tour operators have millions of euro in business from bookings made over the past two years that will now be subject to the new VAT rate next year. She said prepayment of trips is “uncommon” and a lot of these tours will have paid a booking deposit, but the full amount will not be paid until six weeks prior to the organised trip. In correspondence to Donohoe, Andrews asked for the VAT increase to apply to business booked after 9 October 2018 only. She said that the value of forward contracts in the Irish market for 2019, based on Fáilte Ireland estimates, stood at €212 million. Email “A junior minister tried citing a 25-year-old policy to spare tourism firms some pain from VAT hikes”. Feedback on “A junior minister tried citing a 25-year-old policy to spare tourism firms some pain from VAT hikes”.